In order to better understand a specific protein, it is important to be able isolate the protein for study. The purification of proteins can be considered an art form when one considers the difficulty of isolating just one protein from a cell containing hundreds to thousands of proteins. Luckily, as Chapter 1 of MCAT Biochemistry Review highlighted, there is a great amount of variation of the physical and chemical properties of proteins and these differences can be exploited in order to purify the protein of interest. Proteins and other biomolecules are isolated from body tissues or cell cultures by cell lysis and homogenization—crushing, grinding, or blending the tissue of interest into an evenly mixed solution. Centrifugation can then isolate proteins from much smaller molecules before other isolation techniques must be employed. The most common isolation techniques are electrophoresis and chromatography, either of which can be used for native or denatured proteins. Polyacrylamide gel is the standard medium for protein electrophoresis. The gel is a slightly porous matrix mixture, which solidifies at room temperature. Proteins travel through this matrix in relation to their size and charge. The gel acts like a sieve, allowing smaller particles to pass through easily while retaining large particles. Therefore, a molecule will move faster through the medium if it is small, highly charged, or placed in a large electric field. Conversely, molecules will migrate slower when they are bigger, more convoluted, or electrically neutral. The size of a standard polyacrylamide gel allows multiple samples to be run simultaneously, as shown in Figure 3.6. Figure 3.6. 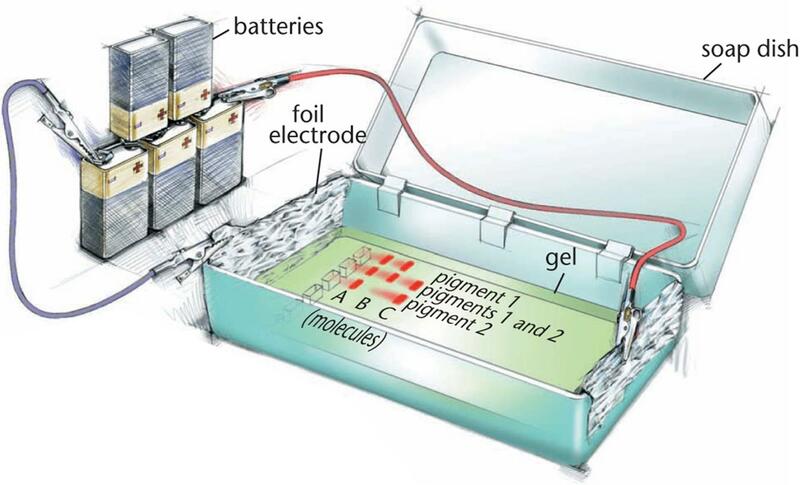 Electrophoresis As an electrolytic (nonspontaneous) cell, electrophoresis moves charged particles toward their respective oppositely charged electrodes; the larger the particle, the more slowly it migrates. Electrophoresis uses an electrolytic cell (ΔG > 0, Ecell < 0), as described in Chapter 12 of MCAT General Chemistry Review. Remember that anions always move toward the anode and cations always move toward the cathode. Polyacrylamide gel electrophoresis (PAGE) is a method for analyzing proteins in their native states. Unfortunately, PAGE is limited by the varying mass-to-charge and mass-to-size ratios of cellular proteins because multiple different proteins may experience the same level of migration. In PAGE, the functional native protein can be recovered from the gel after electrophoresis, but only if the gel has not been stained because most stains denature proteins. PAGE is most useful to compare the molecular size or the charge of proteins known to be similar in size from other analytic methods like SDS-PAGE (described below) or size-exclusion chromatography. Sodium dodecyl sulfate (SDS)-polyacrylamide gel electrophoresis is a useful tool because it separates proteins on the basis of mass alone. This technique starts with the premise of PAGE but adds SDS, a detergent that disrupts all noncovalent interactions. It binds to proteins and creates large chains with net negative charges, thereby neutralizing the protein's original charge and denaturing the protein. As the proteins move through the gel, the only variable affecting their velocity is f, the frictional coefficient, which depends on mass. After separation, the gel can be stained so the protein bands can be visualized and the results recorded. Proteins can be separated on the basis of their isoelectric point (pI). The pI is the pH at which the protein or amino acid is electrically neutral, with an equal number of positive and negative charges. For individual amino acids this electrically neutral form is called a zwitterion, in which the amino group is protonated, the carboxyl group is deprotonated, and any side chain is electrically neutral. The calculation of the pI for an amino acid was discussed in Chapter 1 of MCAT Biochemistry Review. For polypeptides, the isoelectric point is primarily determined by the relative numbers of acidic and basic amino acids. Isoelectric focusing exploits the acidic and basic properties of amino acids by separating on the basis of isoelectric point (pI). The mixture of proteins is placed in a gel with a pH gradient (acidic gel at the positive anode, basic gel at the negative cathode, and neutral in the middle). An electric field is then generated across the gel. Proteins that are positively charged will begin migrating toward the cathode and proteins that are negatively charged will begin migrating toward the anode. As the protein reaches the portion of gel where the pH is equal to the protein's pI, the protein takes on a neutral charge and will stop moving. In isoelectric focusing, a protein stops moving when pH = pI. Let's take a deeper look and see how this works. We'll start with a protein that has a pI of 9. When the protein is in an environment with a pH of 9, it will carry no net charge. If we place this protein onto the gel at a pH of 7, there will be more protons around the protein. These protons will attach to the available basic sites on the protein, creating a net positive charge on the molecule. This charge will then cause the protein to be attracted to the negatively charged cathode, which is located on the basic side of the gradient. As the protein moves closer to the cathode, the pH of the gel slowly increases. Eventually, as the protein nears a pH of 9, the protons creating the positive charge will dissociate, and the protein will become neutral again. A quick way to remember the pH of each end of the gel is to recall that we associate acids with protons, which carry a positive charge, and thus the anode is positively charged. We associate bases with the negatively charged hydroxide ion, which gives us the negatively charged cathode. Anode has acidic (H+-rich) gel and a (+) charge. Chromatography is another tool that uses physical and chemical properties to separate and identify compounds from a complex mixture. Chromatography refers to a variety of techniques that require the homogenized protein mixture to be fractionated through a porous matrix. One of the reasons chromatography is a valuable tool is that the isolated proteins are immediately available for identification and quantification. In all forms of chromatography discussed here, the concept is identical: the more similar the compound is to its surroundings (by polarity, charge, and so on), the more it will stick to and move slowly through its surroundings. Chromatography is preferred over electrophoresis when large amounts of protein are being separated. The process begins by placing the sample onto a solid medium called the stationary phase or adsorbent. The next step is to run the mobile phase through the stationary phase. This will allow the sample to run through the stationary phase, or elute. Depending on the relative affinity of the sample for the stationary and mobile phases, different substances will migrate through at different speeds. That is, components that have a high affinity for the stationary phase will barely migrate at all; components with a high affinity for the mobile phase will migrate much more quickly. The amount of time a compound spends in the stationary phase is referred to as the retention time. Varying retention times of each compound in the solution results in separation of the components within the stationary phase, or partitioning, as demonstrated in Figure 3.7. Each component can then be isolated individually for study. Figure 3.7. Partitioning of Black Ink Thin-layer chromatography; original spot placed on the left side of the card. Components with high retention times remain on the left side of the card; components with low retention times have migrated to the right side of the card. All chromatography is about the affinity of a substance for the mobile and stationary phases, except for size-exclusion chromatography. We can use myriad different media as our stationary phase, each one exploiting different properties that allow us to separate out our compound. In chromatography for protein separation, common properties include charge, pore size, and specific affinities. 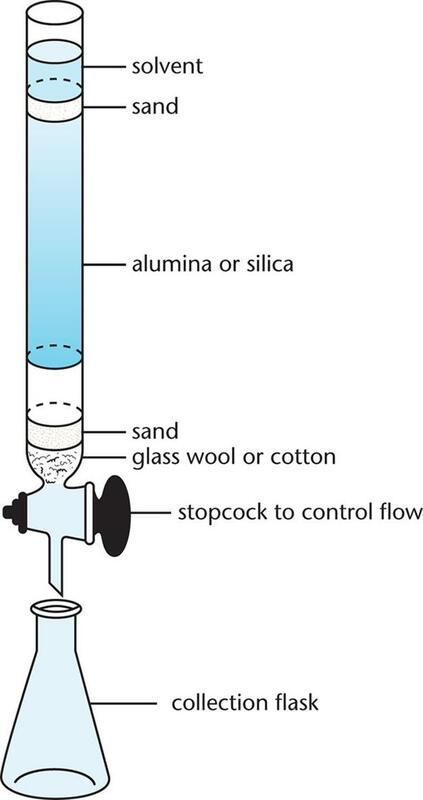 In column chromatography, a column is filled with silica or alumina beads as an adsorbent, and gravity moves the solvent and compounds down the column, shown in Figure 3.8. As the solution flows through the column, both size and polarity have a role in determining how quickly a compound moves through the polar silica or alumina beads: the less polar the compound, the faster it can elute through the column (short retention time). In column chromatography, the solvent polarity, pH, or salinity can easily be changed to help elute the protein of interest. Eventually, the solvent drips out of the end of the column, and different fractions that leave the column are collected over time. Each fraction contains bands that correspond to different compounds. After collection, the solvent can be evaporated and the compounds of interest kept. 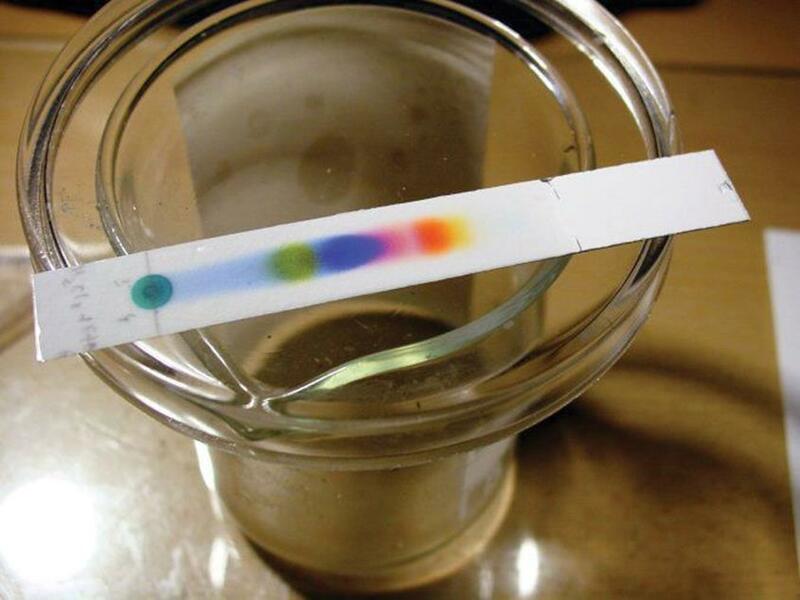 Column chromatography is particularly useful in biochemistry because it can be used to separate and collect other macromolecules besides proteins, such as nucleic acids. Figure 3.8. Column Chromatography The sample is added at the top of the column and a solvent is poured over it. The more similar the sample is to the solvent (mobile phase), the more quickly it will elute; the more similar it is to the alumina or silica (stationary phase), the more slowly it will elute—if at all. In this method, the beads in the column are coated with charged substances, so they attract or bind compounds that have an opposite charge. For instance, a positively charged column will attract and hold a negatively charged protein as it passes though the column, either increasing its retention time or retaining it completely. After all other compounds have moved through the column, a salt gradient is used to elute the charged molecules that have stuck to the column. In this method, the beads used in the column contain tiny pores of varying sizes. These tiny pores allow small compounds to enter the beads, thus slowing them down. Large compounds can't fit into the pores, so they will move around them and travel through the column faster. It is important to remember that in this type of chromatography, the small compounds are slowed down and retained longer—which may be counterintuitive. The size of the pores may be varied so that molecules of different molecular weights can be fractionated. A common approach in protein purification is to use an ion-exchange column followed by a size-exclusion column. We can also customize columns to bind any protein of interest by creating a column with high affinity for that protein. This can be accomplished by coating beads with a receptor that binds the protein or a specific antibody to the protein; in either case, the protein is retained in the column. Common stationary phase molecules include nickel, which is used in separation of genetically engineered proteins with histidine tags; antibodies or antigens; and enzyme substrate analogues, which mimic the natural substrate for an enzyme of interest. Once the protein is retained in the column, it can be eluted by washing the column with a free receptor (or target or antibody), which will compete with the bead-bound receptor and ultimately free the protein from the column. Eluents can also be created with a specific pH or salinity level that disrupts the bonds between the ligand and the protein of interest. The only drawback of the elution step is that the recovered substance can be bound to the eluent. If, for example, the eluent was an inhibitor of an enzyme, it could be difficult to remove. 1. What separation methods can be used to isolate a protein on the basis of isoelectric point? 2. What are the relative benefits of native PAGE compared to SDS-PAGE? 3. What are two potential drawbacks of affinity chromatography? 4. True or False: In size-exclusion chromatography, the largest molecules elute first.